Verandah Cottage is situated at the top of Barrow Road (now number 3). The old photograph was most likely taken between 1905 and 1910, when George Sims and his wife Fanny lived there. It is likely that the old gentleman in the picture is George. Prior to the Sims, Verandah Cottage was occupied by Joseph Tacey and his wife Frances. Joseph was relatively wealthy and on census returns his occupation is ‘proprietor of houses’. Joseph and Frances are recorded as living here on the 1841 census and continued to do so until their deaths in 1858, (Frances), and 1895 (Joseph). Verandah Cottage is an attractive house today, but the older photograph shows that it has always looked special. The old leaded windows with their arched tops are particularly unusual. It is interesting to see the intricate detail above the gate. Some of this still survives, although it is partially hidden by fairly thick rendering. The most obvious change is the addition of the front door! Whilst it is in keeping, if you look closely, it is off centre – which it probably wouldn’t have been had it been part of the original house. 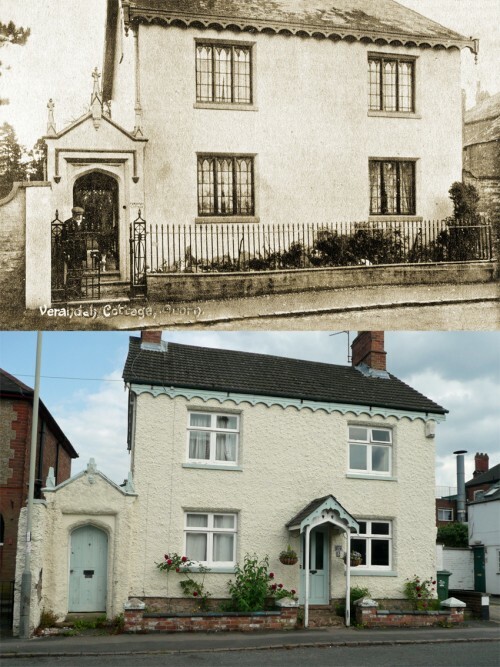 The old photograph was kindly provided by Marion Vincent, and the modern one by Steve Iley – who kept a close eye on the cottage and dashed out to take the photograph when there were no cars!